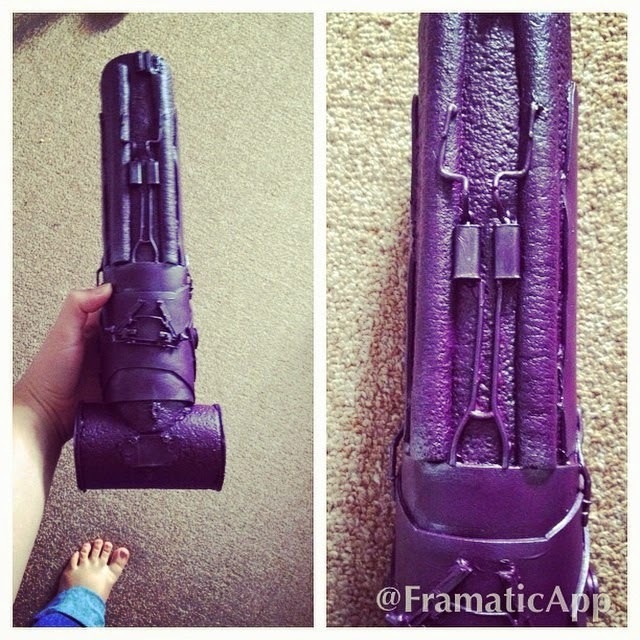 This tutorial is for a basic, nonfunctional, plasma cannon. I use a pool noodle (regular sized, not jumbo) as the main cannon and add on to it. First, cut your noodle to the size you want. I held it up to my shoulder and played with the sizes until I was happy with it. You can also cut it straight, or at an angle, depending on the style cannon you want to do. Measure it out, mark, and cut. Next, using the cut one as a template, measure out a smaller back base piece. Cut out. Draw a circle where your long piece will dissect it. Cut out. Check fit. If it works, glue together. Your base is done. Now, designs! This is completely up to you. I will show you what I did, but feel free to deviate. I drew up a crude sketch (which I did not photograph) then measured for the main piece. 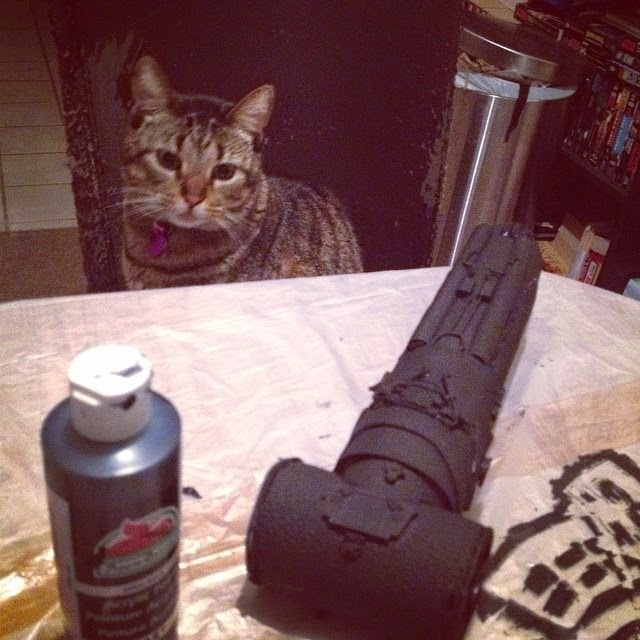 I planned to make this out of foam, and glue it to the cannon base. I then used the measurements to cut out a rectangle out of paper. Then, I used the rectangle as a guide to draw an overlapping design. I held the main rectangle to my base and measured out for a end of barrel design. If you are happy with it, cut it out of foam. Glue in place using hot glue. I failed at taking pics of my next steps! Sorry! I cut out circles, and vents for the circle side ends. Then, I bought a cheap car model kit and just glued random parts on. It ended up looking like this. Paint in your color. I used purple. Then add some weathering. I weathered using black and silver. To make the base, I made a template out of paper of a slanted rectangle. Then, tested it. Once it worked, I used it to cut out two pieces from EVA foam. Glue textured sides together. 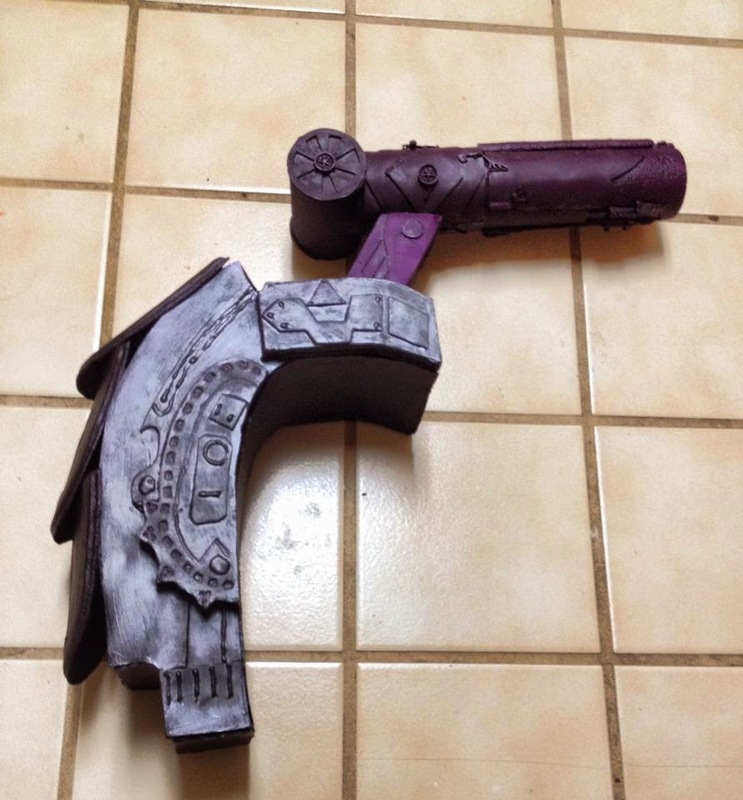 Add some foam for details. Paint. 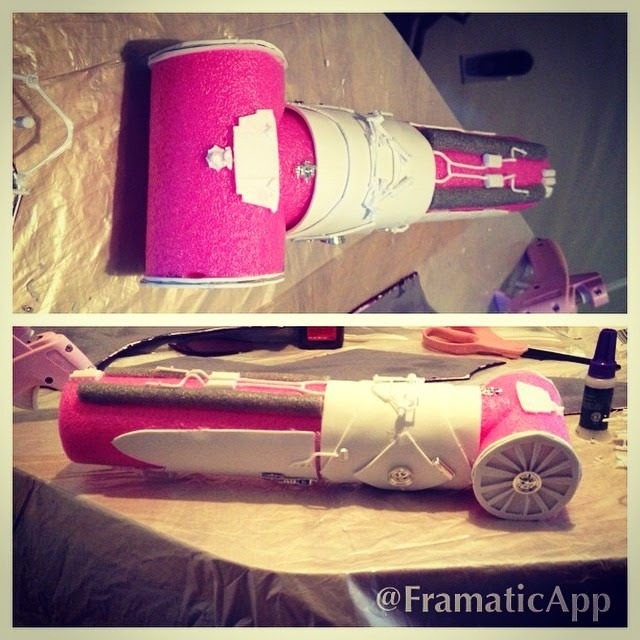 Glue main cannon on. And it looks like this (medpack has separate tutorial).